Many guitarists have found it impossible to find a guitar with the perfect feel and the perfect pickup. 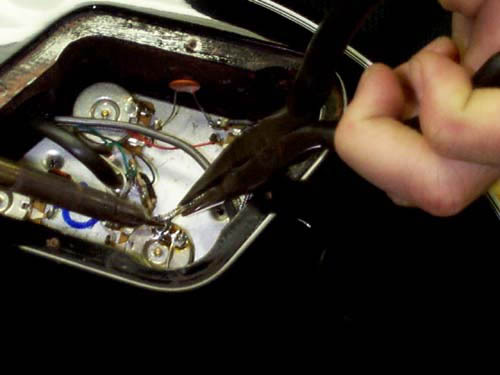 As a result, pickup replacement is one of the more common jobs on a repairman's bench. Like most guitar work, it's easy if you have the right tools and you know what you're doing -- and easy to make a mess of if you don't. First of all, make sure your new pickup is in fact a replacement part for your old pickup. We're going to replace a full-size humbucker with a full-size humbucker. 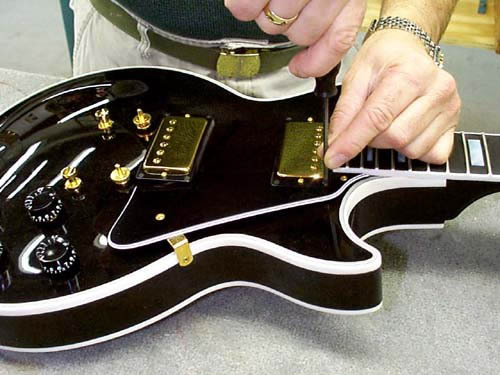 You can replace an old Gibson P-90 with a new P-90 or a Gibson mini-humbucker. But if you're looking to replace a mini-humbucker with a full-size, a P-90 with a P-100 (a double-coil that looks like a P-90 but is deeper), or a vintage Firebird with a new Firebird (the new one's .10" larger), the new pickups won't fit in the old space. 1. Remove the strings. We'll be working on a Les Paul, but if the pickup is mounted through the pickguard, then remove the pickguard, too. 2. Remove the back plate over the control cavity. 3. Desolder the pickup. First, "tin" the tip of the soldering iron (melt solder on it). 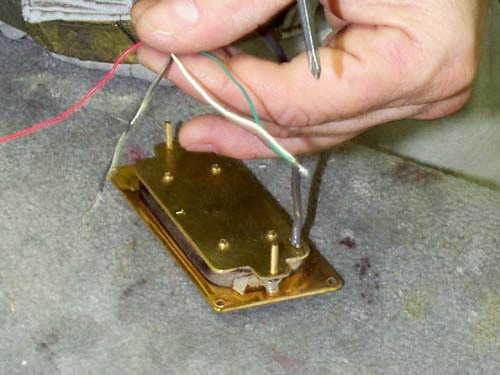 The pickup is soldered to the volume pot. If you've forgotten which pot that is, pull on the pickup and follow the taut wires. 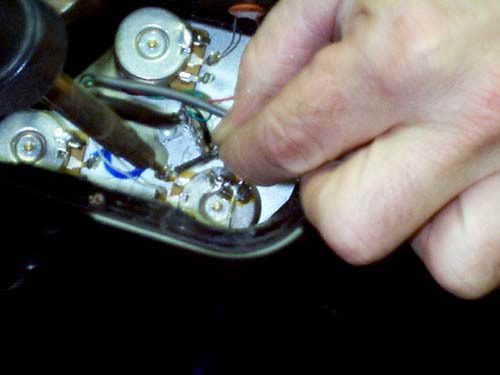 As you're looking down on the pots, the pickup wire should be soldered to the far right terminal of the volume pot. Desolder the pickup by holding the iron on the terminal. Make sure you don't desolder the capacitor. If there's a braided wire, desolder that also. 4. Turn the guitar face up. Remove the four philips-head screws that secure the mounting ring to the top of the guitar. 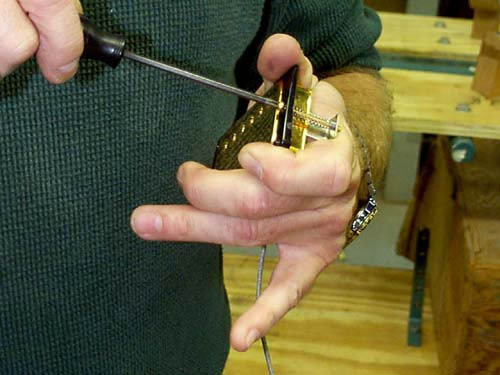 Be sure to hold the tip of the screwdriver with one hand so it doesn't slip and gouge the top. When all four screws are removed, lift the pickup out of the guitar. 5. Remove mounting ring. Unscrew the two slot-head screws, holding your hand around the springs so that they don't pop away from you. 6. Mount the new pickup in the mounting ring. The spring-loaded screws can be tricky. Make sure the pickup is turned in the right direction. The neck pickup (rhythm) should have the row of polepieces close to the neck; the bridge pickup (treble) should have the polepieces on the side closest to the bridge. 7. Snake the wire of the new pickup through to the control cavity. Then screw the pickup down to the top with the four philips-head screws, again making sure you use your free hand to old the screwdriver tip. 8. Solder the wires to the pot. Your pickup will either have two leads with a braided cable or (if it's wired for coil splitting) four leads. Two-lead: skin back the shield and the lead wire will reveal itself. Strip the end of the wire back 1/8" (use a razor blade if you don't have a wire stripper). 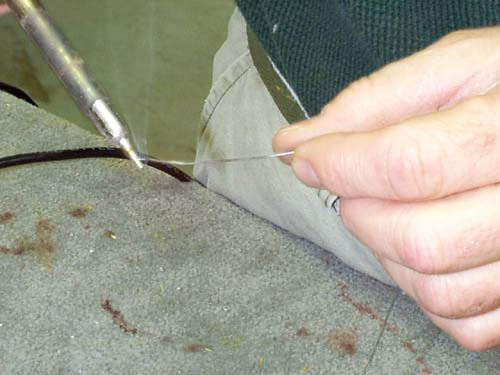 "Tin" the wire by touching the tip of the soldering iron to the exposed lead wire and applying a little solder to soak into the wire. Do the same to the shield wire around the top edge. Solder the lead wire to the right-hand terminal by putting the iron on the terminal, melting solder on the terminal and slipping the end of the lead wire through the hole in the terminal. If you need more solder, add it. 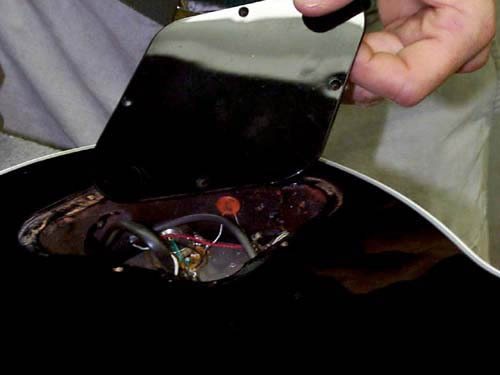 Then solder the shield wire to the case of the pot. Put the tip of the iron on the case of the pot. Use the blade of your flat-head screwdriver to hold the wire down. Use more solder if you need to. Four-lead: On a 4-lead Gibson pickup, the green and white wires are for coil splitting. Since few Les Pauls have had coil taps, we'll save that for a later column. For this job, just tie the green and white leads together and tape themThe red wire is the hot wire, so solder it to the right-hand terminal. Tie the black wire and the bare wire together and solder them to the pot casing. 9. 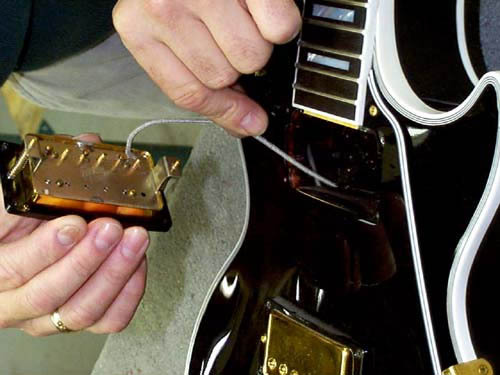 Before closing the cavity, plug the guitar into an amp and tap the new pickup polepieces to make sure the connection is right. Also check the volume control. Then replace the control cavity cover, re-string and rock on.